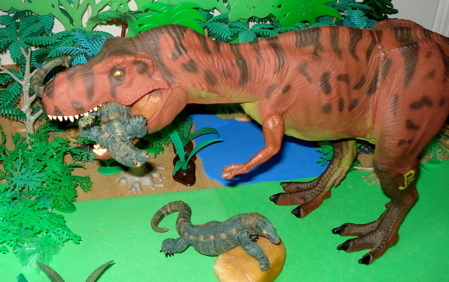 Dinosaur News and Dinosaur Toys. We have long been familiar with the venerable Triceratops (opens new window), been happily introduced to the pointy-headed Styracosaurus (opens new window) and enjoyed the company of the Torosaurus (opens new window), Pachyrhinosaurus and other Ceratopsians. (opens new window). Now we find that there are still more and more and (probably) more. The Wall Street Journal gives us THIS ARTICLE (opens new window) from September 22, 2010 introducing the newest duo to be discovered. We learn that two new Ceratopsians have been discovered in what are now the deserts of Utah. Back in the day (76 mya) it must have been a lush environment that was capable of supporting herds of multi-ton creatures. What makes these new finds unique is the fact that they each are garnished with a large dose of horns on their huge, frilly heads. The Utahceratops (below- picture courtesy of the WSJ & the Utah Museum of Natural History) has one large horn above its nose, two smaller horns laterally above the eyes and two slightly larger cheek horns. 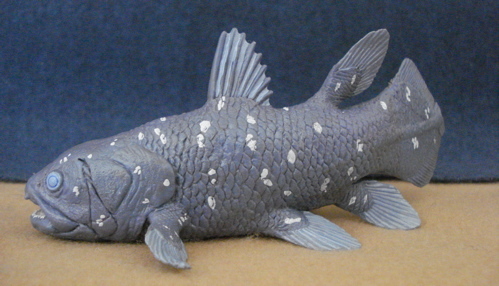 The skull is ~7 feet long with a large horny frill. Utahceratops stood ~6 feet at the shoulder and was ~20 feet long. It is believed to have weighed about three to four tons. This was a large Dinosaur! 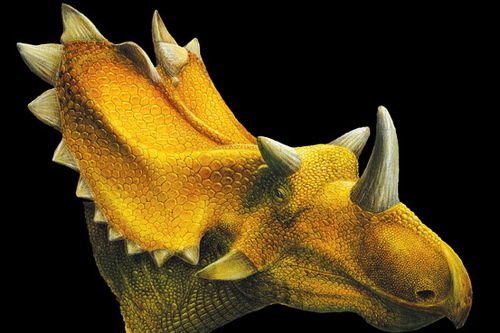 Kosmoceratops (below) was somewhat smaller (~15 feet long and 2.5 tons) but had an even more spectacular visage. In addition to a horn above its nose and two cheek horns it had a pair of curved foot-long horns sprouting laterally above its eyes and... ta-daaah... ten(!) forward curved horns running along the top of its frill. (See below- same picture reference as above). Paleontologists believe the horns were primarily for sexual display and, perhaps, for mating and dominance duels among the males. Don't let your children look at these pictures without adult supervision! 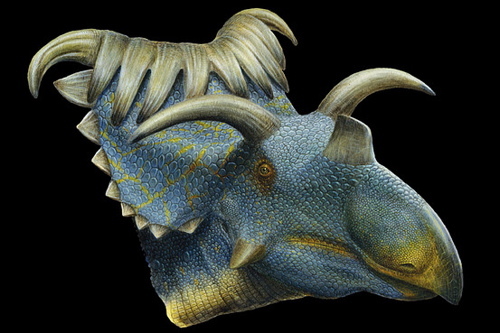 Apparently those big, fancy Ceratopsian heads were created to advertise their passion. Now you can create a website to express yours. See how to express your Passion on the WEB here. The famous physicist Stephen Hawking recently published a book about the creation of the universe. The Wall Street Journal published an excerpt (September 3, 2010) that can be read here (opens new window). The essence seems to be that there is no need for G_D to explain creation. All you need to believe in is "spontaneous creation." Essentially everything for/from nothing. So we're all kind of a "free lunch." "I look out on this beautiful world,..."
"...I look at my friends, and I know the source of creation...."
Meanwhile DinoTot has his own opinion about both theories. COMPARE theories of creation. Then compare sites that will help you create your website. Do that here. Then decide. "They can fix the Mammoth with a little barbecue sauce." Roadside Attractions aren't getting the traffic that they used to. Is that what is happening to your website too? Do you want a website with virtually guaranteed traffic? Find out how, take the Alexa traffic test here. WoW! 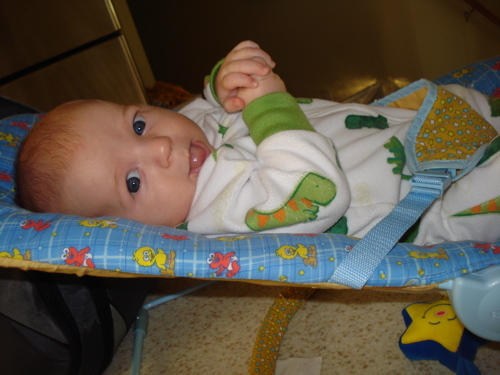 Scientists have recently discovered (opens new window) another, small, Tyrannosaurus in Australia. What makes this one special is that it is the first, and only Tyrannosaurid to be discovered in the Southern Hemisphere. 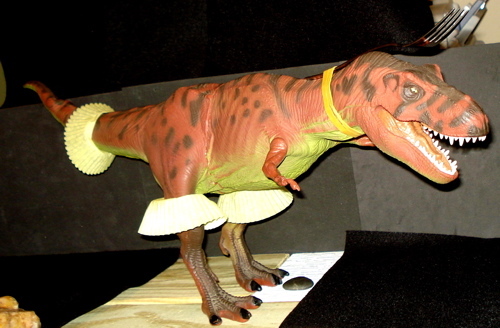 Previously all the Tyrannosaurs have been from the Northern continents. 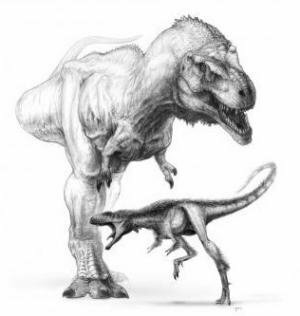 "It's not the size of the dog in the fight..."
As a general rule the Northern Tyrannosaurs have been large, over 25 feet in length and several tons in weight. This guy is only about ten feet (3m) long and believed to be 80kg (180lbs) in weight. That is interesting in itself. "...but the size of the fight in the dog! " "So you guys plan on evolving into Chihuahuas, right?" "Don't even try to horn in on my turf"
... but that is my own personal surmise and unsupported by documentation. 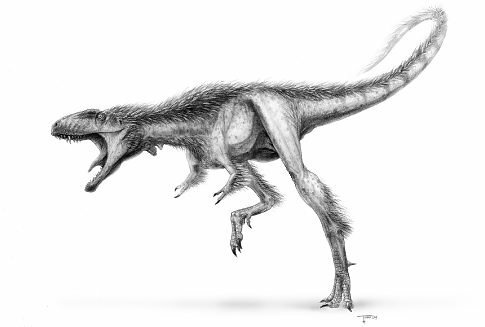 We may expect future discoveries of Tyrannosaurs in the other Southern continents now that paleontologists know to look for them. "Little cousins with little appetites, perfect." Today we will look at an interesting article in the 'Science Daily' website from June 2009. To a Dinosaur a year is hardly relevant. 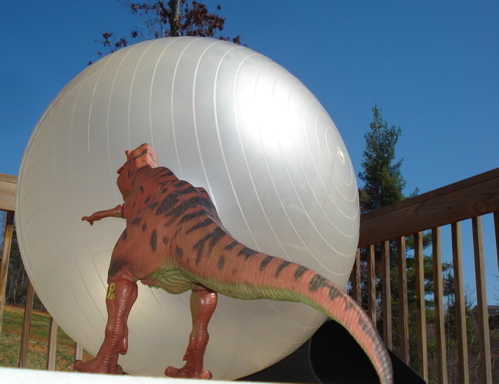 Just remember, we are closer in time to the T-Rex than it is to the Allosaurus! The article (opens new window) recounts from "a paper published June 21 (2009) in the Zoological Society of London’s Journal of Zoology" that "Scientists have discovered that the original statistical model used to calculate dinosaur mass is flawed, suggesting dinosaurs have been oversized." 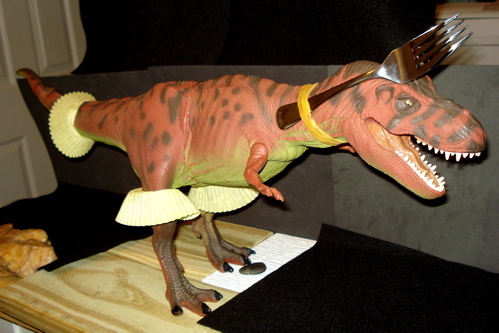 To summarize the article- Dinosaurs were thinner than we thought! "Now that I'm officially thinner I'll do something about my skin..."
"...and maybe take a shower." Well, we all have choices to make and you can't be too thin or smell too good, or so I've heard. Here is a choice you should be interested in. 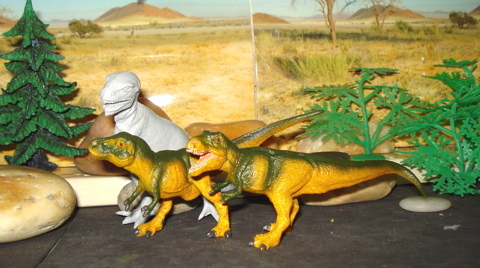 Our Safari Ltd Nigersaurus page is coming right along but so is everything else... busy, busy, busy. It should be ready tomorrow or Monday. I know that you are all on the edge of your seats. Don't fall off because Rexford might be a-waitin'. 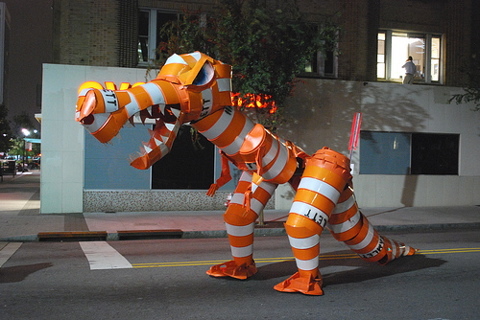 So for today's treat we have a "Barrel Monster" made out of those safety barrels you see at road construction sites. 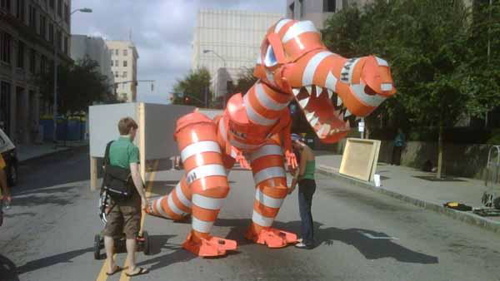 This was constructed (in the middle of the night) in mid-September 2009 by Joe Carnevale of Raleigh, North Carolina as sort of a gag and it got a lot of attention at the time. Even some private requests, like Michelangelo. It also got Joe, I recall, community service as our DOT (Department of Transportation- those are the people who like to rip up college-town streets in the early Fall) didn't appreciate it for some reason. As you can see in the above photo, it drew a lot of attention. 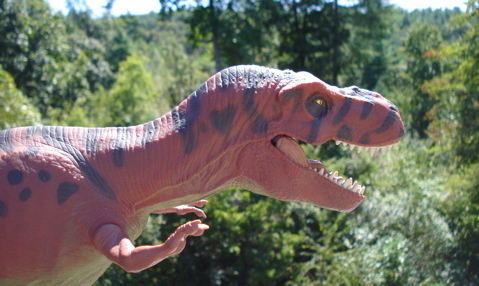 Named "Barrelosaurus" one can see that with its three fingered hands it is some kind of Theropod, perhaps an Allosaurus but certainly not a Tyrannosaur. Rexford it isn't. Those barrels are used to guide traffic-flow at construction sites. Alexa provides website traffic data. See how sites do by taking the Alexa traffic test, here. 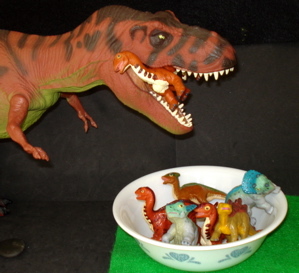 About three weeks ago I was the recipient of one of the biggest surprises in my nearly sixty-year career of Dinosaur toys collecting. 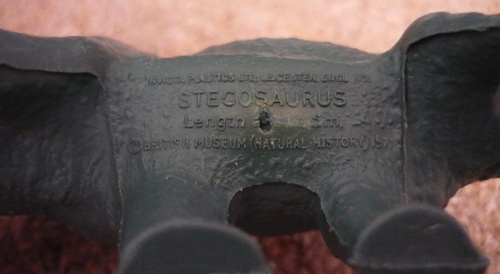 I received a Contact-O-Saurus fossil-gram (email) from a collector in Australia who had just purchased a dark GREEN INVICTA STEGOSAURUS on eBay. He had never seen one in green and neither had I. All the many Invicta Stegosaurs in my experience have been pink. Various shades of pink but none verging on green. 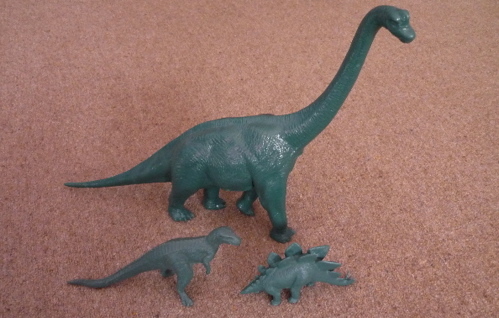 The only dark green Invicta figures I knew of are the Brachiosaurus and the Megalosaurus. My first suspicion was that this was somehow a bootleg 'copy' of the Invicta figures. I asked him for pictures and one he sent was of the 'belly of the beast' which clearly includes the Invicta-NHM logo. Definitely Invicta! 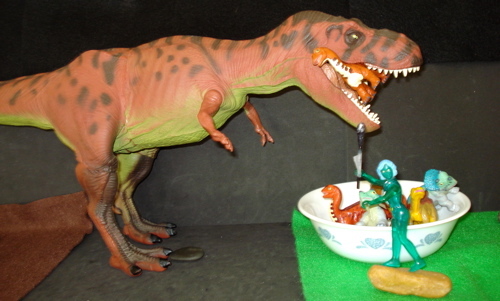 Contact with other Dinosaur figure experts came up negative. No one had heard of these in green. and hard on its heels I was informed by a reader in Ireland that she wanted to know the cash value of one that she purchased years ago. Are these more common than I had thought? Or awesomely rare? If you know or think you know please enlighten me. I am currently entertaining all theories. I have contacted the NHM who referred me to Invicta Ltd. and I am awaiting their reponse. 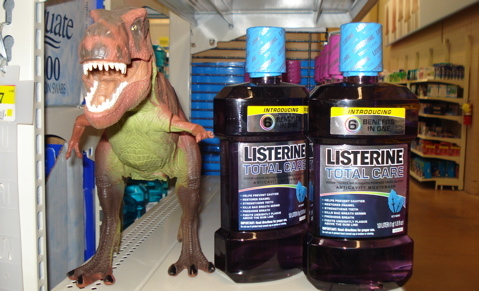 Certainly the Invicta Megalosaur thinks dark green is both visually attractive and quite tasty looking in Stegosaurs. Rexford and family couldn't care less whether they are pink, multi-hued or dark green. 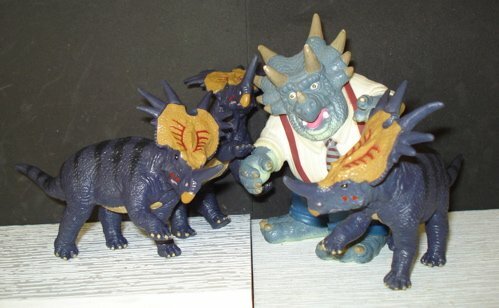 "Just please slow down you little tasties...."
The dark green Invicta Stegosaurus is pretty rare. But successful websites with the help of SBI! aren't. Check out these owner-videos and find out for yourself. Once again we have another news article (opens new window) about a new discovery in the Dinosaur world. This time it is another Tyrannosaurus described as "horned" and graceful like a "ballerina" that draws our attention. "I've gotta get a new agent." Here (opens new window) is an interesting article about the Dinosaurs and their rise in response to two mass extinctions (Triassic and Triassic/Jurassic boundary). The theory goes that thanks to the M.E.s ecologic niches opened up for the Dinosaurs (who had been hanging around in the wings for tens of millions of years). There are a number of links on the page offering up more information about extinctions, mass and otherwise. Mr. Rexford- may we have your viewpoint on this awful impact? Well, well, well.... What will modern science think of next? Here (opens new window) we have an article impugning the reputation of the great Dinosaur predators. The Allosaurus, Tyrannosaurs and others are being 'accused' of going after "easy" prey, babies and such, as opposed to getting into the ring with adult Sauropods, Stegosaurs (with their dangerous spikey tails) and pointy headed Triceratops. We went down to the Dino-town Childcare Center to interview Rexford who is volunteering today in order to get his take on this calumny. "Yes, I try to get down to the center for a quick snack whenever I can. A guy can get hurt fighting a Triceratops over a bite to eat. ALL us predators do it when we have the opportunity. What's the big deal? Isn't it obvious that a smart predator (like myself) will go after the easiest prey? Gimme a break.... I'll take another hors d'oeuvres now, thank you. The daycare center is my favorite snack bar"
We hope that you enjoy our little Dinos in the News blogs and are very close to finishing the preparations on our comparison blogs. We will be beginning them soon. Hang on for that. Well, well, well. Just when you all thought that Dinosaurs were long gone and there was nobody new under the sun.... Another new creature was discovered in the jungles of the Philippines. This time a SIX FOOT LONG, golden-spotted Monitor lizard! Now where has that little devil been hiding out since man began cataloging everybody? Our opening two pictures are from the article (opens new window) documenting this reptilian find. 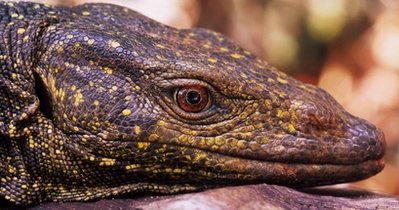 (Due to factors beyond our control and for dramatic effect we will be illustrating the remainder this blog with photos of the excellent Komodo Dragon by Papo.) This new monitor lizard is much smaller than the mighty Komodo so we aren't really dealing with a re-emergence of Dinosaurs here. 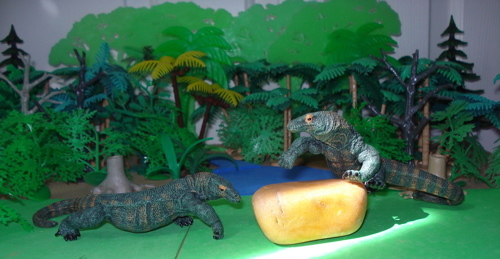 Not that the Komodo Lizard is a Dinosaur, which it isn't. Discovered on the main Philippine Island of Luzon initially in 2004 (by scientists, the natives had been eating them for years) it has just been determined that this lizard is a new species, at least to us. It has been around for a while. Interestingly enough it is arboreal although our opening photos do seem to suggest that it is also good at laying around. 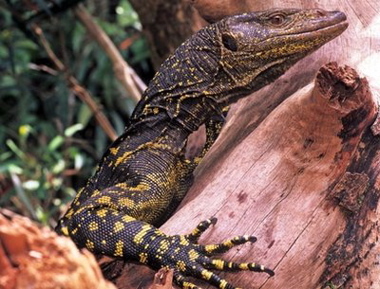 Named the "Northern Sierra Madre Forest Monitor Lizard" or Varanus bitatawa it is one of the few species of Monitor Lizard that prefers fruits and snails to carcasses (when asked it said that carcasses are "yucky") but still grows to six and a half feet (6.5 feet, 2 meters) in length. A pretty impressive fellow. "I owe my robust health and great size to kumquats and escargots." "Oh cxxp! Now we're in for it." "I LOVE it when they expand the menu!" I guess it all depends which side of the menu you're on, doesn't it? Tomorrow we'll have some more of Rexford's adventures and an interesting fact or two about his life and times. I've been given some new exercises to stretch my shoulder and boy, do they hurt. Rexford has offered to "put you out of your misery" but I'm not sure what he means so I'm not taking him up on it. Once again we have a news story about the Dinosaur's demise. As you know they all drew to the same conclusion approximately 65,000,000 (that's sixty-five million) years ago when what is presumed to be an asteroid dropped into the Earth for a visit. You can read about that, here (opens new window). 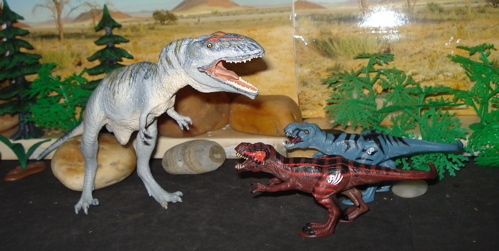 Just as a matter of relativity we are closer in time to Rexford and his fellow T-Rexes than he was to the Allosaurus. In any event this cataclysmic fender-bender resulted in what is known as a mass extinction and the Dinosaurs went the way of... the Dinosaurs. 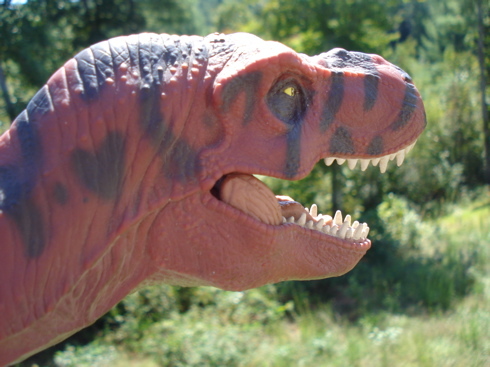 We hope that you have enjoyed the Dinosaur News blog archive page. Click here to discover the main Blog Archive page with a listing of all our archived blogs.